DO NOT ASK US TO MAKE AN EXCEPTION. 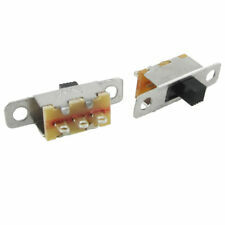 PIC Switches 2 Position Slide Switch DPCO, 500 mA @ 50 V DC. Power Switching IC. Substitution Boxes. 1 x Saia-Burgess V3SYR1-UL IP-67 SPCO Roller Lever Microswitch, 5A@ 250V AC. Motor Drivers. You will get 5 Slide Switches. 1.5 amp 240 vac. 0.5 amp 125 vdc. Idec A6 Series. Ideal for such applications as PLC inputs, logic level switching or where space is at a premium.Models include illuminated and non-illuminated pushbuttons, pilot lights, selectors and a push-lock/turn reset switch. Grayhill 71 Series Multi-Deck Rotary Switches. Grayhill 24 Series Single-Deck Rotary Switches. Poles: DPDT. 22S: Poles & Circuits – DPDT (On-None-On). Crisp actuation positively indicates circuit status. Mounting Type: Through Hole. Top actuation permits flexible board design. P: Actuation – Top Actuated. Etc.For use in low power applications. We will happily work with you to find a solution to any problem. Make sure this fits. by entering your model number. If there's a problem, just let us know and we fix it. Max;Insulation Resistance : 100m?. We do our best to process as quickly as possible. In the case of factory defects, we will replace the product for you. Mounting Hole Dia. : 3mm/ 0.12';Switch Total Size : 25 x 17x 7mm/ 1' x 0.67' x 0.28'(L W H);Knob Size : 20 x 10x 2mm/ 0.8' x 0.4' x 0.08' (L W H). If there's a problem, just let us know and we fix it. Model : SS-12F15G6;Action Type : SPDT. Knob Size : 3 x 3 x 6mm / 0.12" x 0.12" x 0.24"(L W H);. Insulation Resistance : 100m？？ Min at 500V DC;. 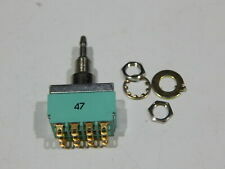 Specification: Description: Features: 6pins, 2 NO 2 NC slide switch. Widely used in radio, TV, audio advice and other instruments. Product Name : Vertical Slide Switch; Model: SS12F15-G3; Position : 2; Pins Design : 3 Pins ( Single Rows ) Contact Type : 1P2T; Rating : DC 50V, 0.5A; Contacts Resistance : 30Mohm; Insulation Resistance : 100Mohm Minimum Load : DC 500V; Dielectric Strengths : AC 500V / 1 minute; Life Test : 10000 cycles/ minuteKnob Height : 3mm / 0.12"; Pitch : 3mm / 0.12"Mounting Hole Diameter : 2.32mm / 0.09"; Overall Size(Approx) : 19 x 5 x 10mm / 0.75" x 0.2" x 0.39"(L * W* H) Package : 5 x Vertical Slide SwitchColor : As shownMaterial : Plastic & MetalWeight : 5gEasy Structure, Mini Body, 3 Terminal, Vertical Handle,1 Pole 2 Throw, Sliding Knob Actuator.Widely used to control operation of many small power electronic projects, including volume and other controls for au. Product Name : Slide Switch; Model : SS-12F1G3 Terminals Quantity : 3; Working Power : 0.5A 50V DC; Withstand Voltage : AC 500V for 1 minTerminals Size(Each One) : 3 x 1.6mm/ 0.12" x 0.06" ( L * W) Switch Total Size : 2 x 0.6 x 1.1cm/ 0.8" x 0.24" x0.43" (L * W* H)Knob Size : 3 x 3 x 3mm/ 0.12" x 0.12" x 0.12" (L * W * H) Package Content : 50( /-2%) x Slide SwitchMain Color : BlackAction Type : SPDTContact Type : ON/ON, 2 PositionsMaterial(External) : Plastic, MetalWeight : 39gThe sliding switch is with 3 terminals, vertical handle, single pole double throw action type, 2 position on/on contact type.Widely used to control operation of many small power electronic projects, including volume and other controls for audio video, dimmer controls for lights etc. No. Minimum Load : DC 500V; Dielectric Strengths : AC 500V / 1 minute; Life Test : 10000 cycles/ minute. Knob Height : 3mm / 0.12"; Pitch : 3mm / 0.12". Also a great component for DIY. Action Type : SPDT. Power : DC 50V 0.5A. Knob Size : 5 x 4 x 5mm / 0.2" x 0.16" x 0.2"(L W H). 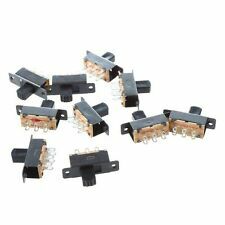 20 Pcs x Slide Switches. Also note that monitor settings may vary from computer to computer and may distort actual colors. Specification:Product Name Slide Switch Position Number 3 Control Type On-Off-On, DPDT Rated Power AC 125V, 6AAC 250V, 3ASwitch Overall Size 35 x 13 x 18mm/ 1.4" x 0.5" x 0.7" (L*W*H) Knob Size 7 x 6 x 5mm/ 0.3" x 0.2" x 0.2"(L*W*H) Hole Diameter 3mm / 0.118" Pin Size 5 x 2mm/ 0.2" x 0.07"(L*W) Pin Spacing 7mm/ 0.275" Material Plastic and Metal Main Color Silver Tone Net Weight 25g Package Content 5pcs x Slide Switch Description:Features 6 pins, DPDT, 3 position.Widely used to control operation of many small power electronic projects, including volume and other controls for audio video, dimmer controls for lights. etc. Or PCB DIY use. 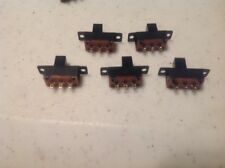 5 Pcs Miniature Slide Switch DPDT Long round dolly Black. 2 Position on-on. DPDT = Double Pole Double Throw (Double throw is another way of specifying Change Over). Dolly Length 12mm Profile dia 3.8mm. SALECOM TS-13 Push-pull Switch 3Pin 2Position 250V/125V Slide Switch SPDT 10. SLIDE HANDLE: Nylon. Electrical Life: 30,000 make and break cycles at full load. initial @2-4 VDC,100 mA. Description: Features black slide button, DPDT, 6 silver tone terminals. Simple design makes it easy to install. Easy Structure, Mini Body, 3 Terminal, 1 Pole 2 Throw, Sliding Knob Actuator.Widely used to control operation of many small power electronic projects, including volume and other controls for audio video, dimmer controls for lights. etc. Also a great component for DIY.Product Name: Slide SwitchModel: SS12F55Type: Single Pole Double Throw, 2 PositionTerminal Quantity: 3 PcsWorking Power: 0.5A 50V DCContact Resistance: 30mÎ© MaxInsulation Resistance: 100mÎ© Min at 500V DCWithstand Voltage: AC 500V for 1 minHole Diameter: 2mm / 0.08"Terminal Size(Each One): 3.3 x 1.5mm / 0.13" x 0.05"( L * W)Weight: 10gPackage Content: 10 x Slide SwitchNote:Light shooting and different displays may cause the color of the item in the picture a little different from the real thing. Model SS23D32. Type 2 Pole 3 Throw. Insulation Resistance 100mΩ Min at 500V DC. Switch Total Size 23 x 7 x 13mm / 0.9" x 0.27" x 0.51" (L W H). Working Power 0.5A 50V DC. Main Color Silver Tone, Black. Defond Slide Switch DSF-2316 series. 3-way slider for high power electrics 8A/250VAC or 16A/125VAC. High quality with UL approval seal. 5 pieces - free worldwide shipping!. Specifications: Description: There are 300 Pcs sliding switches here, thay are 3 terminals, SPDT action type and on/off 2 positions. Widely used to control operation of many small power electronic projects, including volume and other controls for audio video, dimmer controls for lights. etc. Action Type : SPDT. Power : DC 50V 0.5A. Knob Size : 5 x 4 x 5mm / 0.2" x 0.16" x 0.2"(L W H). 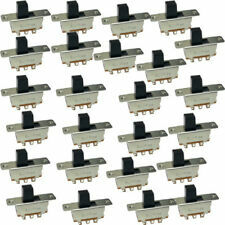 20 Pcs x Slide Switches. Insulation Resistance : 500mΩ Min at 500V DC. Actuating Force: 2.5±0.5N. Due to the difference between different monitors, the picture may not reflect the actual color of the item. Electrical Life: 30,000 make and break cycles at full load. SLIDE HANDLE: Nylon. initial @2-4 VDC,100 mA. Dielectric Strength: 1,500 V RMS @ sea level. Rate(item arrived). Specifications:Description:Features: Easy Structure, Mini Body, 3 Terminal, Vertical Handle,1 Pole 2 Throw, Sliding Knob Actuator.Widely used to control operation of many small power electronic projects, including volume and other controls for audio video, dimmer controls for lights. etc.Also a great component for DIY. 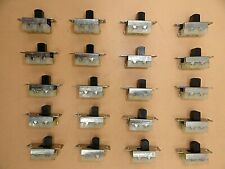 50pcs SS12F15 1P2T 3 foot 2 stalls Slide Switch. To slide the button to connect or disconnect the circuit. Rated load: DC 50V 0.5A. Insulation resistance: more than 100ohm. Size: 20 6 12mm. Length of handle: 5mm. This saving is reflected in our prices. We take full responsibility, but may ask for a photo. They will be put inside of a plastic bag or two before being taped to avoid getting tape residue on them. Type: Single Pole Double Throw, 2 Position. Also a great component for DIY. Specification: Description: Features: Easy Structure, Mini Body, 3 Terminal, Vertical Handle,1 Pole 2 Throw, Sliding Knob Actuator. Widely used to control operation of many small power electronic projects, including volume and other controls for audio video, dimmer controls for lights. etc. Also a great component for DIY. This is a UL Listed Switch that is. This switch has 2 positions ON on one side &. ON on the other side. Specifications: Product Name Slide Switch Model SS23E04-G6 Type 2P3T Contact Type 3 Position, On/On/On Terminal Quantity 8 Working Power 0.5A 50V DC Contact Resistance 30mΩ Max Insulation Resistance 100mΩ Min at 500V DC Withstand Voltage AC 500V for 1 min Mounting Type Through Hole Hole Diameter 2.2mm / 0.08" Pin Size 3 x 1.2mm / 0.12" x 0.04"( L * W) Pin Pitch 1.2mm/ 0.047" and 3.6mm/ 0.14" Switch Total Size 24 x 6.3 x 11mm / 0.94" x 0.25" x 0.43" (L * W* H) Knob Size 5 x 3 x 6mm / 0.2" x 0.12" x 0.24" (L * W * H) Material(External) Plastic, Metal, Electronic Parts Main Color Silver Tone, Black Weight 6g Package Content 5 x Slide Switch Description:Features: Easy Structure, Mini Body, 8 Terminal, Vertical Handle,2 Pole 3 Position, Sliding Knob Actuator. Rated Load: AC 250V 3A, AC 125V 6A. Simple design makes it easy to install. Main Color: Silver Tone, Red. Specifications:Description:Features: Easy Structure, Mini Body, 6 Terminal, Double Pole Double Throw, Sliding Knob Actuator.Slide Switch is for changing circuit by sliding the mini handle of the switch to control the circuit to be ON or OFF.Widely used to control operation of many small power electronic projects, including volume and other controls for audio video, dimmer controls for lights. etc.For use in low power applications. Circuit: 1P2T. Mounting Type: Solder Lug. Switch Feature: Slide Switch. You will like it ! FREE Trial !